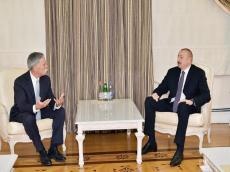 President of the Republic of Azerbaijan Ilham Aliyev has received Chief Executive Officer and Executive Chairman of the Formula 1 Group Chase Carey. CEO and Executive Chairman of the Formula 1 Group Chase Carey hailed his another visit to Azerbaijan, saying that the Baku-hosted Formula 1 was considered to be the best one according to the analyses of last year’s 21 races, Azertag reported. The head of state expressed his satisfaction with the recognition of Formula 1 Baku races. Pointing to the rapid increase in the number of tourists arriving in Azerbaijan, President Ilham Aliyev noted that foreign tourists spent more than two billion manats in Azerbaijan last year. He underlined that Baku’s hosting the Formula 1 race, which enjoys an audience of nearly half a million, makes a significant contribution to ensuring the tourist influx to the country. Chase Carey said he fully shares the head of state’s ideas, adding that the people who arrive in Baku to watch the race highly appreciate what they see in the capital, and express their love for Baku. He noted that holding the Formula 1 race in Azerbaijan contributes to both attracting potential tourists to the country and ensuring Baku's worldwide recognition. The sides hailed the importance of the 3rd international conference on the "Benefits of hosting major sports events", and exchanged views on bilateral cooperation prospects.